1994: - Performance of three plays: AMANI (peace) MCHAWI WETU (The Witch) and TUSI LA KARINE, (An insult of a Century). 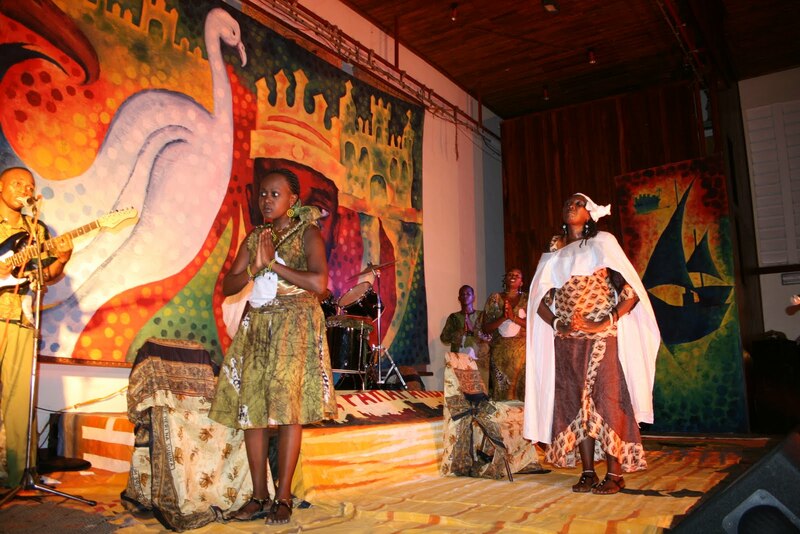 These plays were performed at various places of Dar es Salaam region: The University of Dar Es Salaam, Chang’ombe Teachers College and Institute of Finance Management (IFM). - Performance of dances and a play on Reproductive Health (STDs) and HIV/AIDS performed at the University of Dar Es Salaam. The play was sponsored by (Association of Family Planning of Tanzania – UMATI). - Performance of dances and a play titled HAKI YANGU on women’s right. It was performed during the Inauguration of the former Tanzania Women Association (BAWATA). 1995: Performance of a dance drama and a play on Reproductive Health: STDS) and HIV/AIDS at the University of Dar Es Salaam. The Performance was sponsored by UMATI. - Writing and performances of a play KILIO CHETU (OUR PLIGHT) under sponsorship of Medical Aid Foundation. An NGO working on Health sector. The play was later published by TPH. The production toured in Dar Es Salaam schools. 1995/96: Performance of a play titled NIFANYEJE? (What should I do?) On a war against AIDS. This musical play was sponsored by PASADA (A catholic NGO working for people living with HIV/AIDS in Dar Es Salaam). 20 performances were held in Dar es Salaam and coast region. - Five more street performances of the play were done in Dar es Salaam city under the sponsorship of the National AIDS control Programme. - Organized a special performance at Goethe Institute (German Cultural Center). The production also involved the late Mzee Moris Nyunyusa the famous drummer. - Performance of Poetic recitations and dances titled AMANI YA DUNIA (world peace) at Kilimanjaro Hotel and White sands Hotel under sponsorship of League for world peace (a religious organization). 1998: Performance of Poetic recitations on the “Culture of Reading” during the inauguration of Children Books Exhibition which was sponsored and held at Swedish embassy. - Production of KWA MANUFAA YA NANI (to whose benefit) a one-hour play on the conflict of prawn farming project in Rufiji basin. The Institute of Resource Assessment (IRA) of the University of Dar Es Salaam sponsored the play. The performance took place at the University of Dar Es Salaam and Bagamoyo college of Arts. - Performance of a poetic recitation titled MAMA UMATI – (Mother UMATI) during the inauguration of UMATI’s five years strategic plan. 1999: Production of a play KILIO CHA ARDHI, (A cry for land) a play on land problems with regards to land Bill prepared by the government. PAA did three street performances and two indoor in DODOMA Hotel for members of parliament. All productions were done in Dodoma Municipality in collaboration with Haki Ardhi. 2001: Tour of MKWEZI NA NAZI production in south African Market theatre Festival in Johannesburg.